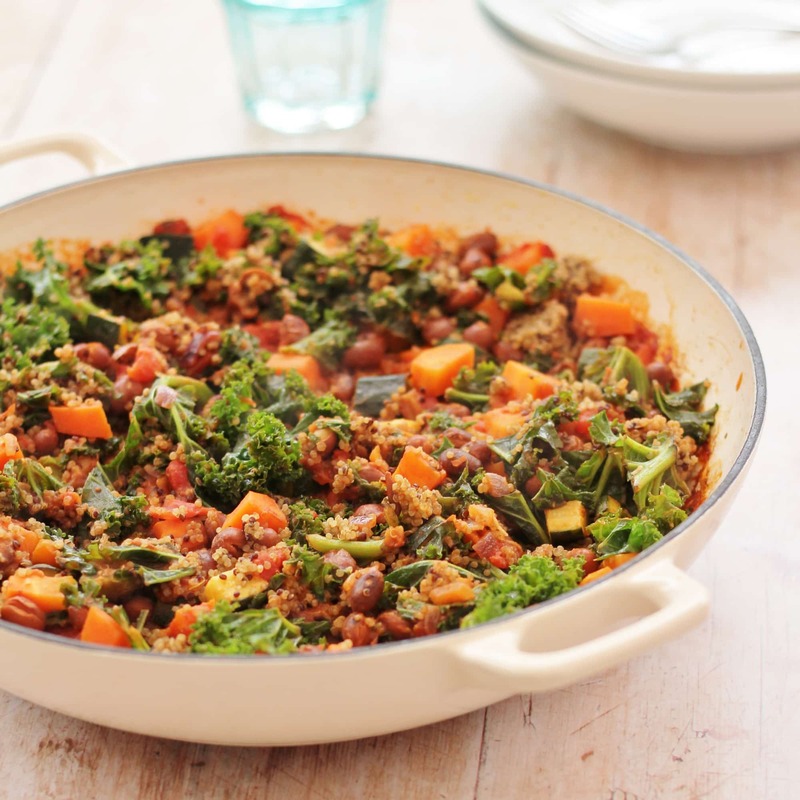 This quick and easy one pot Quinoa, Kale and Borlotti Bean Stew ticks so many boxes – it’s gluten free, dairy free, vegan, full of goodness, comforting and above all totally delicious. It is rare for food to be comforting AND healthy, it is usually one or the other, isn’t it? But this gorgeous vegan stew is one of those rare exceptions. 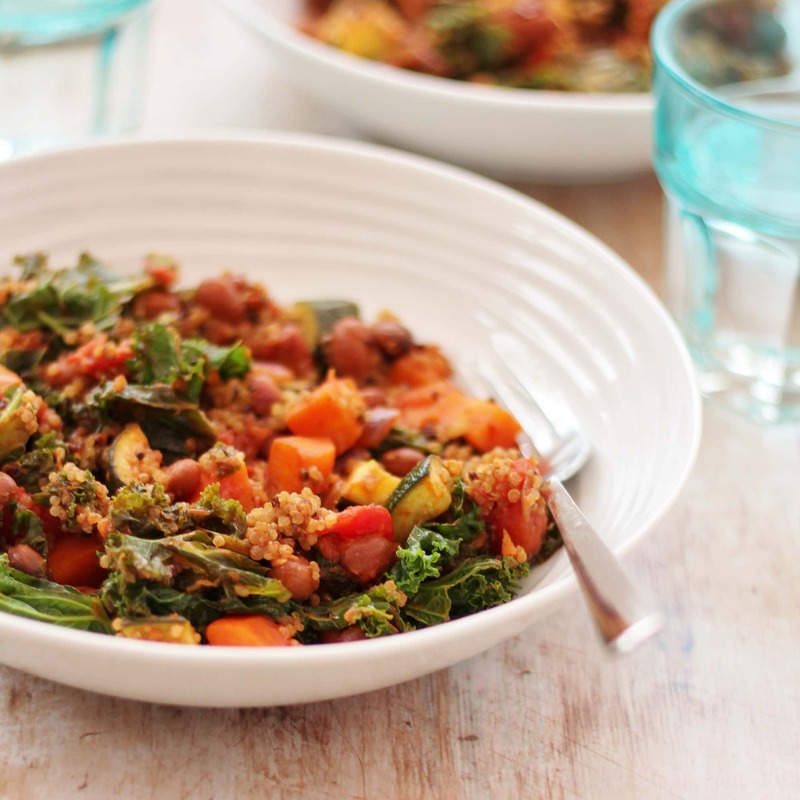 It is full of goodness, from the kale, quinoa, borlotti beans, garlic, carrots, tomatoes and courgettes and yet it is so fabulously warm and comforting. 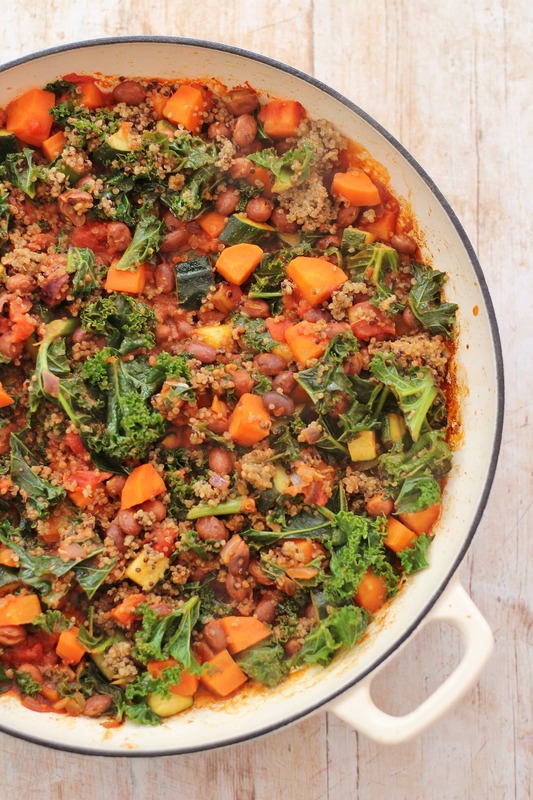 Plus this stew has bags of flavour and is ridiculously quick (15 minutes!!) and easy, and is made in one pot. Perfect for those evenings when you just want to flop! It’s also easy peasy to adapt and sub in other things, making this great for clearing out the cupboards/fridge. 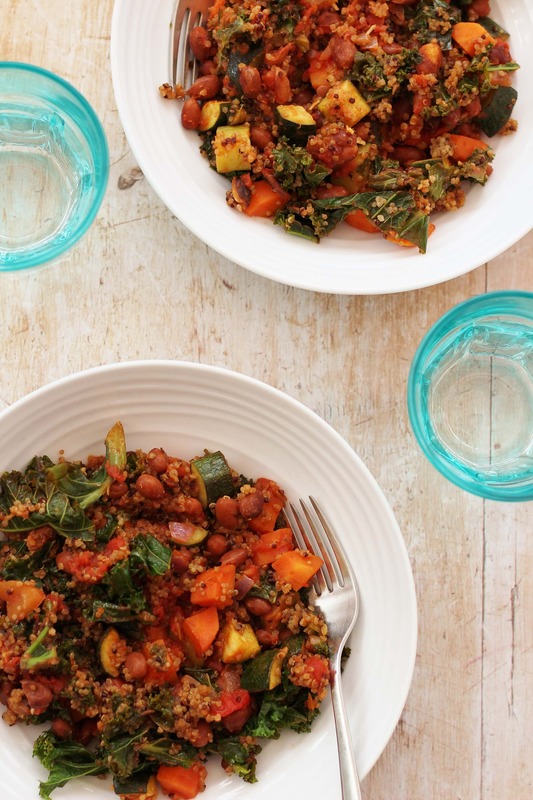 You could use different veggies, different spices, different pulses – chickpeas would work well…you could also swap the tomatoes for coconut milk and even sub in spring greens or spinach instead of the kale. 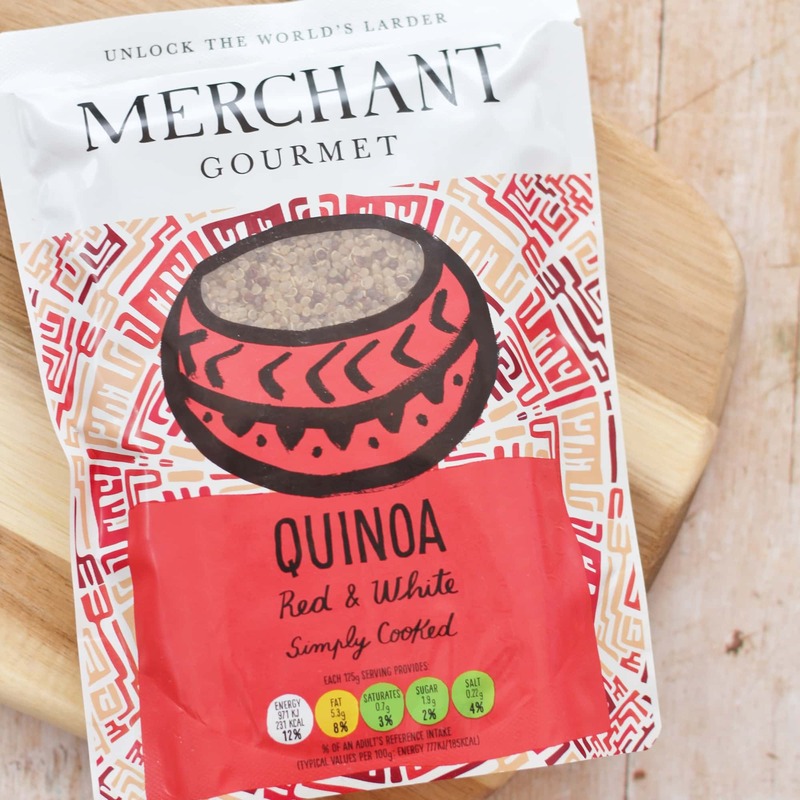 To make this super quick I have used a ready cooked bag of quinoa – my favourite is the red and white quinoa from Merchant Gourmet. But you can cook your own quinoa first if you prefer. I think this makes a fab one pot meal in its own right, but if you feel the need, you could serve this as a side dish instead, with grilled chicken or salmon. To drink, this kind of tomato based veggie stew works very well with either a zingy Sauvignon Blanc, if you want white wine, or a soft and juicy Merlot if you prefer red. I think in both cases something from Chile or New Zealand would be fab. In a large pan over a low heat, fry the onion, carrot and courgette for 5 minutes, stirring occasionally, until softened and just beginning to brown. Add the chilli, fennel and garlic and fry for 1 more minute, then add the salt and pepper, tomatoes, borlotti beans and kale. Turn the heat up and cook for 3 minutes. Add the quinoa and cook for 1 more minute and then serve. 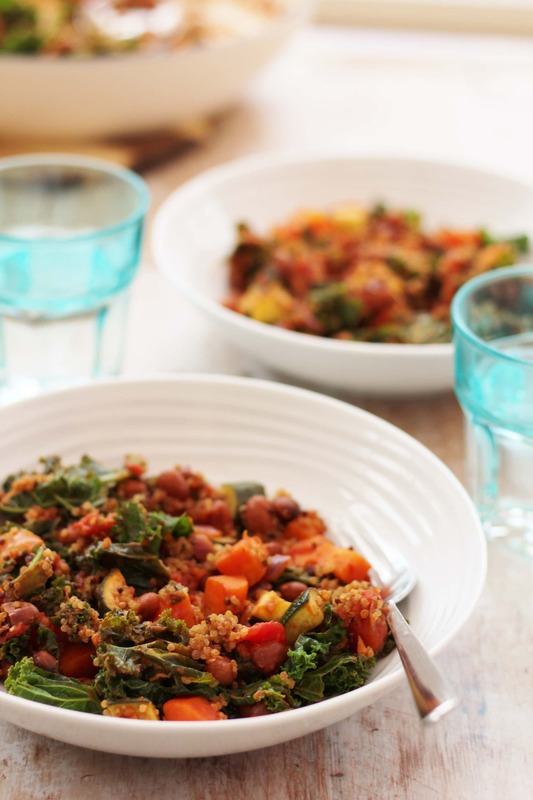 I am sharing this recipe with Meat Free Mondays, Brilliant Blog Posts, Cook Blog Share, Free From Fridays and Recipe of the Week. Wow this is my kind of meal Eb – you could have written this with me in mind! Sadly I’m with Jenny in that the kids wouldn’t go for this – but that wouldn’t stop me trying, lol! Ooh this sounds so delicious Eb, though i know what you mean about food either being comforting or healthy. I just love how versitile it is, and I bet it’d be great in a tupperware container for lunch too. Love this! Quinoa is yummy and I only use it in salads so I’m quite eager to try it this way 🙂 Thanks for joining in with #FreeFromFridays. Thank you Eb for this lovely recipe. My stepson’s girlfriend is vegan and she came round while I was making it for her. She confessed that she doesn’t like quinoa so I left it (and the chilli as she can’t handle it) out and used it as a rustic sauce for some pasta instead. I also added a sprinkling of Marigold bouillon powder into it while it was cooking. It was utterly delicious – colourful, lots of texture and we all ended up choosing the vegan sauce over the meatballs that I’d provided for the others round the table. Result!